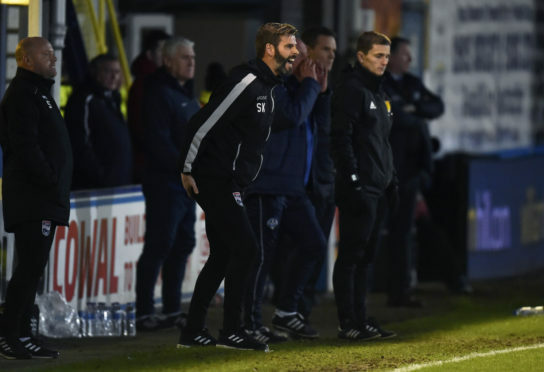 Ross County co-manager Stuart Kettlewell will be in the stand for Monday’s Scottish Cup Highland derby encounter against Caley Thistle after being handed an immediate three-match ban with a further three suspended. Kettlewell attended a Scottish FA hearing at Hampden Park yesterday after being accused of breaking two disciplinary rules during County’s 1-0 loss to Morton on January 4, with the 34-year-old charged with misconduct and making physical contact with a match official in aggressive manner – believed to be fourth official Craig Napier. After admitting both conduct allegations Kettlewell was hit with a six-match ban, although three games are suspended until December 31, meaning he will miss Monday’s derby against Inverness, next Friday’s IRN-BRU Cup semi final at home to East Fife and the Championship trip to Partick Thistle on February 23. Fellow co-manager Steven Ferguson will take sole charge of the side in the meantime, and he has urged his players to strike the balance between derby passion and cool heads when Inverness visit Victoria Park in Monday’s Scottish Cup last-16 tie. Ferguson said: “We talk about that passion, desire and wanting to do well for your club and players – and Stuart epitomises that. “Sometimes you get close to that line, but I wouldn’t to take that passion from the game. “If you took out the passion, that willingness to win and hunger, it would be boring. The game would be like watching nothing. “The discipline needs to be there though. It’s that fine line. Players play on the edge. It’s a game of adrenaline and men who are desperate to win. “It is a competitive game, so you’re always on the edge for it, but the team that keeps the discipline and the team and individuals with calm heads amid the storm are those who will do well in the game. Setting aside the derby glamour, Ferguson says the prospect of a place in the quarter-finals of the Scottish Cup is a major incentive for the Dingwall men, adding: “We’ve already spoken of it as a group. If you don’t want to be involved in this game, you’re definitely in the wrong place. “It’s good for the area and it has a different feel, a different edge than a league game. Both clubs will really relish the opportunity and the platform of being live on national television, to show everybody how good they are.